Flores, Rosado and O’Neill of Prevention Point, fighting to make Kensington clean and safe. Philadelphia – Sporting orange flak jackets in lieu of superhero capes, Nydia Flores, Elvis Rosado and Francis O’Neill are routinely saving lives and helping to make streets safe for Philadelphians. An apparent victim of an overdose, Flores immediately made sure the man was breathing fine and called for assistance. Both veterans of the “Prevention Point” community organization that serves this neighborhood with a variety of drug counseling and treatment programs, Flores withdrew medications to respond to an emergency situation that she says occurs “too regularly” in Kensington. According to a recent Drexel University study some 425,000 people use a syringe to inject illicit drugs each year in the United States and 16,000 die from overdoses. In 2008 -the most recent data available- 442 Philadelphians died of drug overdoses. The Drexel study further notes that the majority of such overdose victims are found in the “street,” 75 percent are male and in less than 10 percent of the cases do those coming to the aid of the individual have training and are carrying naloxone. After this intervention at Kensington and Lehigh, Flores and O’Neill proceeded to the corner of Front Street where they met Elvis Rosado, a Case Manager at Prevention Point. Rosado, Flores and O’Neill were scheduled to participate in a neighborhood beautification effort, leading a group of students from across the country in a three-hour clean-up blitz under the aegis of Philly Rising. 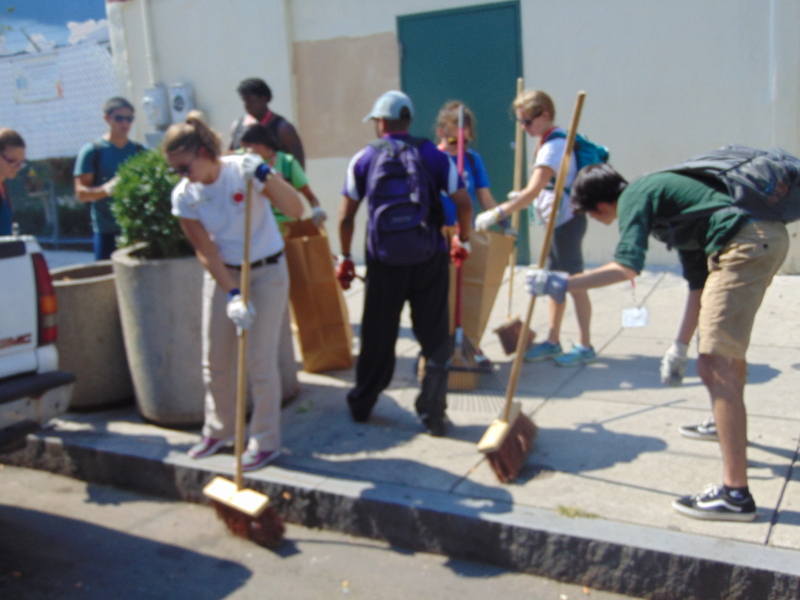 City year volunteers were part of a Philly Rising clean-up of Kensington. Philly Rising is an initiative spearheaded by Philadelphia Deputy Mayor Richard Negrin, which targets neighborhoods besieged by chronic crime, abandoned properties, litter and other quality of life issues. Philly Rising brought together nearly 40 students from the City Year program – ranging in age from 17 to 24 – as well as volunteers from the New Kensington Community Development Corporation and Prevention Point. “We’re out here in this neighborhood every day” Ms. Flores told the student clean-up crew, cautioning them to avoid “picking up needles” they were likely to find in the street. As El trains passed above, brigades of students pushed brooms and scooped plastic bottles and cigarette butts with coal-shovels along a beleaguered swath of Front and Kensington Ave. A desultory crowd of men and women watched the clean-up from the shade of an Alcoholics Anonymous Center that stands opposite the St. Francis Inn, a Franciscan Center which provides meals and shelter to more than 200 recovering addicts and alcoholics in a neighborhood that once boasted tens of thousands of manufacturing jobs. Jenny Rodriguez of Mayor’s office of Immigrants defends policy that promotes cooperation with police. 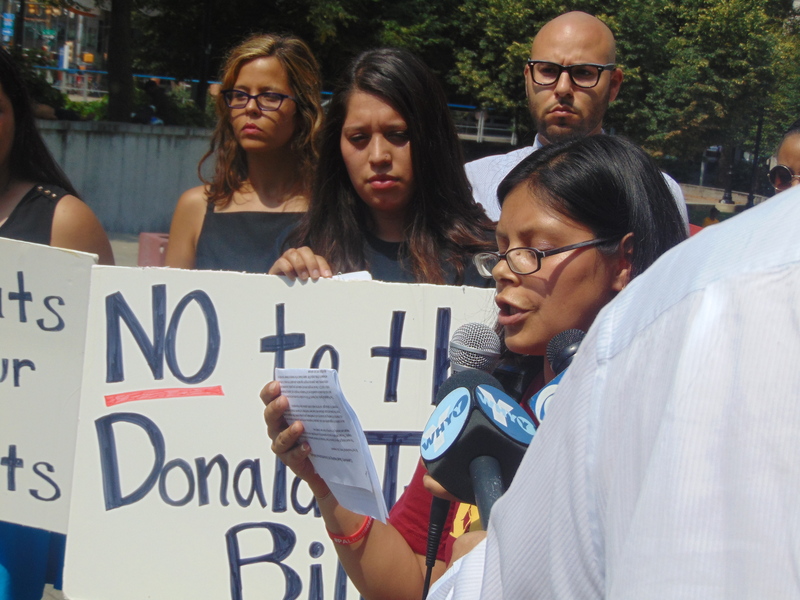 Philadelphia – “We must stand united against the criminalization of our immigrant community” and indiscriminate “deportations,” declared Erika Almiron, Executive Director of Juntos, the immigrant advocacy organization. Beneath the shadow of the iconic Love Park statue at 15th and JFK, Ms. Almiron was joined by Jennifer Rodriguez, Exec. Director of the Mayor’s Office on Immigrants and Multi-Cultural Affairs and Democratic Mayoral Candidate Jim Kenney, Thursday, to denounce a Republican led effort in the U.S. Congress to withdraw Homeland Security funding to cities that enact sanctuary city-type policies. ‘ Although immigration policies are crafted at the federal level, cities are where immigrants live,” said Rodriguez, “and mayors are uniquely positioned” to make decisions about public safety. Blanca Pacheca criticized those using a “senseless” crime to promote their agenda. “If we eliminate the fear of deportation immigrants are more likely to cooperate with police and become engaged with government,” which increases the overall safety in neighborhoods. “I wish the U.S. Congress was as animated over gun violence and education as they are about holding immigrants without a warrant,” added Jim Kenney. Kristina Gonzalez & Music Festival – St. Jude’s Children’s Research Hospital. Kristina Gonzalez, the main attraction at festival with mother Uta and sister Victoria. Philadelphia – A fundraising ‘Music Festival for St. Jude Children’s Research Hospital’ drew a crowd of between 250-350, Saturday, as dancing and gamboling along Fifth and Lycoming streets accompanied the vivacious rhythms of bands like Sabor Criollo, Trio Renacer, Los Muchachos del Solar, Jose y La Fuereza del Merengue and Masacote y su Banda Swing. In addition to the salsa and merengue sounds pulsating outside Cayey’s Bar, the event featured a variety of guest emcees, including news anchor Ilia Garcia and Radio host Marilyn Rodriguez of La Mega radio 105.7, who was accompanied by fiancé and Camden County Deputy Clerk Angel Fuentes. Despite the appeal of these local luminaries, there was no doubt who the main attraction of Saturday’s musical festival: it was six-year old Kristina Gonzalez. Donning a cap that covers the temporary effects of radiation treatments she is undergoing at St. Christopher’s Hospital for Children for a form of cancer called rhabdomyosarcoma, Kristina’s smile and exuberant personality outshone all at the daylong festival. While immense trays of Puerto Rican foods – from arroz con pollo, arroz con granules to potato salad – were piled high inside the Cayey bar, Kristina was bathed in a steady stream of hugs from family and friends. Kristina hugs Father Hector Gonzalez during festival to fund St. Jude’s Children’s Hospital. 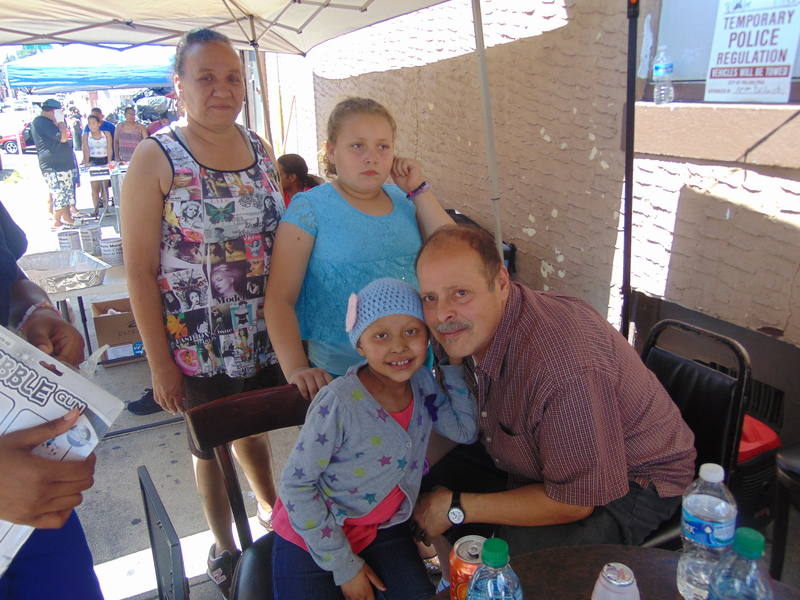 Since being diagnosed with a cancerous tumor in her back that had reached stage 4, Kristina has required treatments and therapies under a costly regimen that would have quickly left the Gonzalez family destitute. And that is where St. Jude Children’s Research Hospital comes in. St. Jude Children’s Research Hospital is a global leader in research and treatment of childhood cancer, pushing survival rates to as high as 90 percent today. In addition, the families of children having cancer treatments never receive a bill, as St. Jude’s covers the all cost associated with the care of children like Kristina. During the last forty years the incidence of childhood cancers has increased 24 percent. In 2014, an estimated 15,780 children and adolescents were diagnosed with cancer, with a roughly 90 percent survival rate. At pediatric cancer centers, such as St. Christopher’s Hospital for Children, the Gonzalez family receive a variety of support services, which include social-workers, counselors, nutritionists and physical therapists. The type of treatment Kristina receives is recommended by team of physicians, and largely depends upon her overall health, the type of cancer and the stage of the cancer. The treatment options range from surgery, chemotherapy, radiation or in some cases a stem cell procedure. On Monday, Sen. Bob Casey (D-Pa.) unveiled new legislation, the Advancing Hope Act, that expands on a pilot program the Senator had previously passed into law. The legislation would incentivize drug companies to research treatments for rare, life-altering diseases that impact pediatric patients but are too infrequently developed because so few children are diagnosed. 25th Anniversary of ADA/ ‘A Long Way to Go’. Emilio Pacheco (c) is a volunteer who works with the disabled in the Philadelphia area. 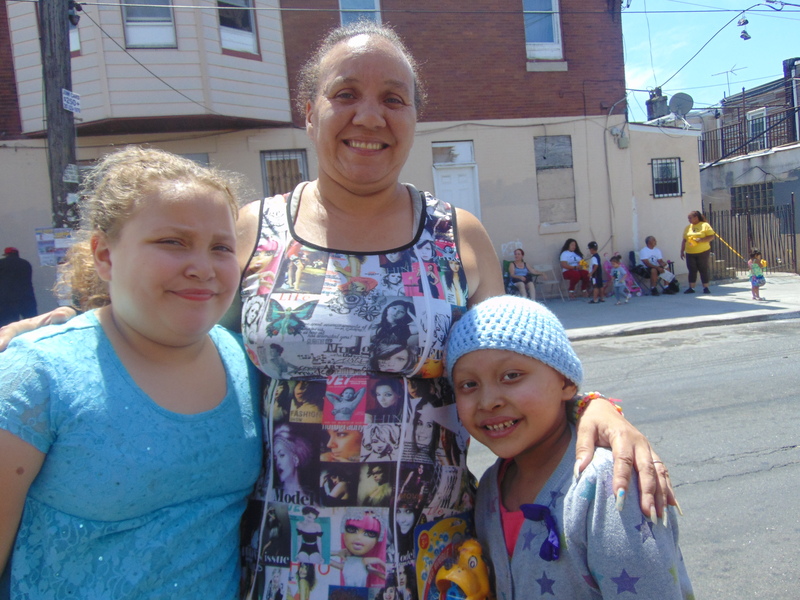 Philadelphia- While Hurricane Sandy was wreaking havoc across much of New Jersey and New York city in October of 2012, Melba Torres, 53, was just one of hundreds who lost electricity in her apartment complex. With the building cast in darkness and elevator no longer working, an NPR report noted that Ms. Torres- who suffers with cerebral palsy and requires an electric wheelchair to move about – was not only trapped in her 8th floor apartment, but was scarcely able to move around a place she has decorated with an enormous Puerto Rican flag. 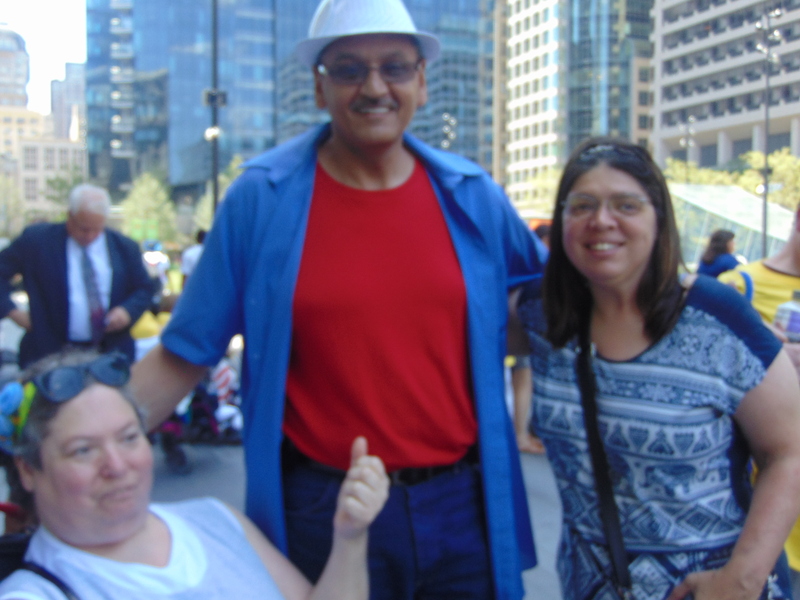 On Saturday, some four to five hundred of the city’s disabled community, along with advocates and supporters, gathered at City Hall’s Dilworth Plaza to celebrate the 25th anniversary of the Americans Disabilities Act (ADA). A comprehensive law signed by Pres. George H.W. Bush on July 26, 1990, the ADA resulted in providing the type of employment, housing and public service protections granted to other minorities in the civil rights laws of the mid-1960s. From modified curbs, ramps at offices buildings and apartments, talking street lights and vehicles, to buses and trains equipped with lifts to accommodate wheelchairs; the American with Disabilities Act (ADA) has produced a quiet revolution in the physical and social contours of our cities and nation. Despite the great advances made in the last quarter of a century due to the ADA, the law’s principal author, Sen. Tom Harkin (D-IA), suggested, “we still have a long way to go.” It was a message echoed by former Pennsylvania Gov. Ed Rendell, Sen. Bob Casey (D-Pa.) and Councilman Dennis O’Brien. “Life without the ADA would be one of exclusion and isolation,” said Councilman O’Brien, a longtime advocate for the disabled in Harrisburg and city hall. As Councilwoman Jannie Blackwell advocates for the homeless, and Councilwoman Maria Quinones Sanchez is the voice of immigrants and Latinos, Councilman Dennis O’Brien has similarly spoken out on behalf of the disabled in the city and beyond. The Republican Councilman noted the law’s comprehensive nature had “shifted the burden,” requiring society to make the necessary accommodations and adopt “technologies” that make public facilities and private businesses accessible to all. Former Gov. Ed Rendell recalled the progress made during his own administration, with equal treatment of disabled largely being achieved through policies that allowed funds “to follow the person,” not the institution. In addition, providing incentives and subsidies to construction firms meant “disabled-friendly” construction practices. 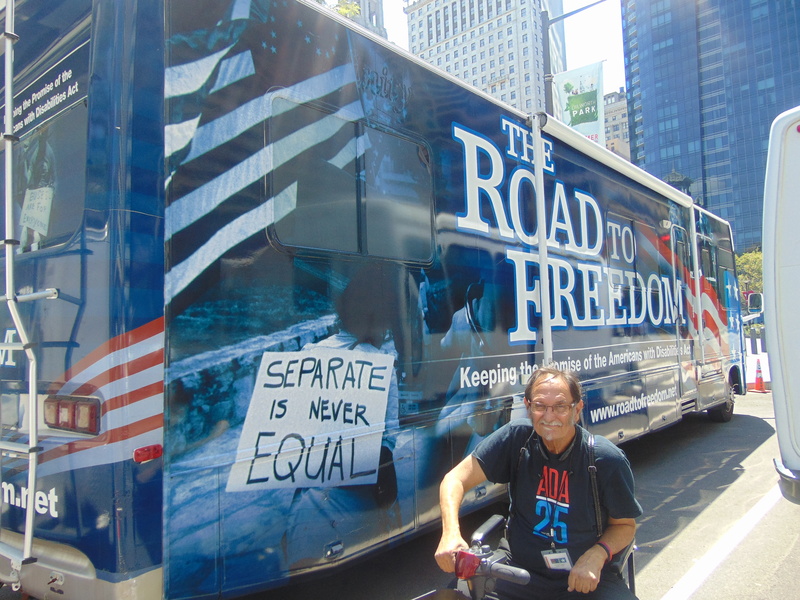 Photographer Tom Olin toured the country in this Freedom bus to push passage of ADA. With the adult-disabled population experiencing an unemployment rate hovering near 80 percent, Sen. Harkin urged advocacy efforts aimed at reducing those jobless numbers. While stressing the need to “change attitudes and perceptions,” Sen. Harkin suggested that employers “need to look at people and discover what the (disabled) can do,” not what they can’t.